Color in the egg and elephant illustrations and then practice writing capital and lower-case E.
The E hat in this series has an ear, egg, and an elephant to be colored in before practice writing capital and lower-case Es on the lines. Assemble the hat and wear on your head. 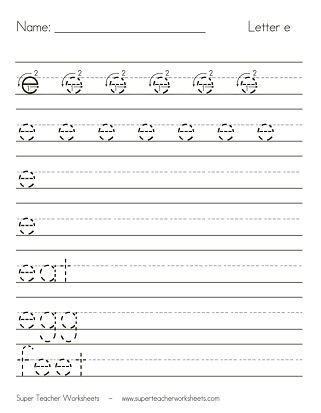 Trace the dotted lines to practice writing lower-case e on this printable worksheet. Here's another worksheet to practice writing lower-case e by tracing the gray lines. 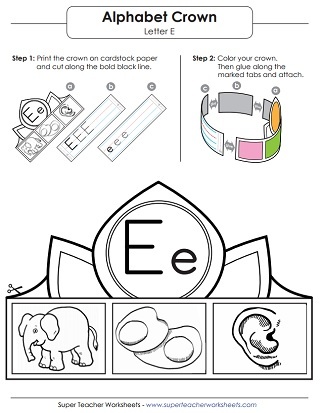 Practice handwriting capital letter E on this worksheet by tracing the dotted lines. Trace the gray lines to practice handwriting upper-case E.
Practice reading, writing, and recognizing capital and lower-case E.
Dot the circles with a bingo dabber on this printable worksheet to learn to recognize letter E.